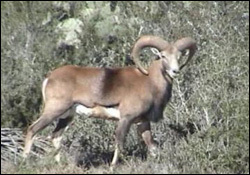 The Red Sheep is light brown to a roan-looking - not very red - often with a hint of white saddle in the males. Males have variable coat patterns, whereas females have a more uniform color. Red Sheep are available for hunting all year long, and originated in Asia. Males have heavy ridged horns and weigh around 110 pounds, while females are usually hornless and weigh 60-85 pounds. They breed from November to December, and have a 5-month gestation.